This year’s Education Career Night was a success! 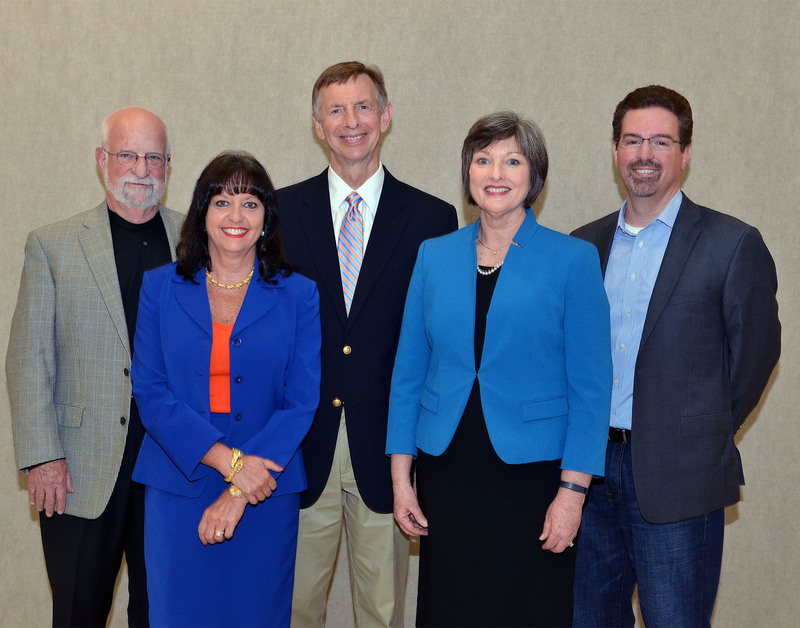 A panel of four dynamic College of Education alumni offered career advice and talked about the distinctly different career paths they each have followed—quite successfully—after earning their education degrees at UF. The event was held at the Reitz Union Auditorium on the evening of April 8th. Tina Calderone (MEd ’81, Ed Admin; EdD ’99, Ed Leadership) Seminole County School Board representative and former college administrator at UF. Jayne Ellspermann (MEd ’84, Ed Leadership) principal of Ocala’s West Port High School and recently named ‘National Principal of the Year’ by the National Association of Secondary School Principals. Steve Freedman (BAE ’64 & MAE ’66, Education) adjunct Professor of Health Policy and Pediatrics at the University of South Florida College of Public Health and Founding Director emeritus of the Institute for Child Health Policy of the State University System at UF. Skip Marshall (BAE ’95, MEd ’97, Elem Ed; EDS ’07, Curriculum & Instruction) Vice President and CTO of the Human Capital division of Tribridge (a Tampa-based technology services firm specializing in business applications and cloud solutions) and former teaching and technology fellow at UF. For more photos of Career Night, click here. 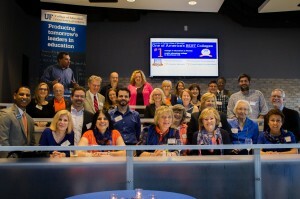 The College of Education hosted an EduGator Alumni Reception at the Epicuriean Hotel’s Culinary Theatre in Tampa on March 31st. 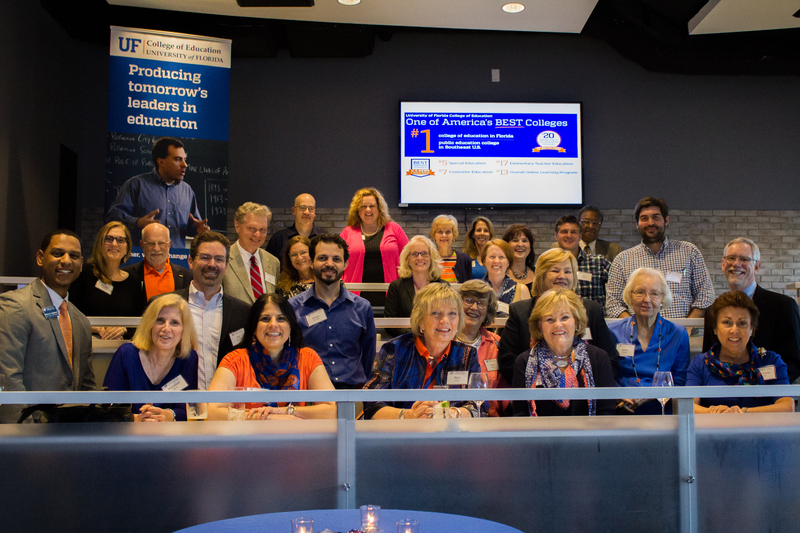 Thirty COE alumni and friends gathered together for food, drinks, conversation, a cooking demonstration, and to hear the latest updates on the College’s initiatives. The College of Education plans to host future EduGator alumni gatherings around the state of Florida. EduGators in Tampa, Gainesville, Chicago and St. Augustine areas take note: We’re heading your way and would love to get together with you! Delicious food, great conversations and reminiscing with your fellow COE alumni await you, and you’ll hear the latest updates on the College’s exciting initiatives and latest trends in educator preparation and research. Here are the dates to save for the EduGator Gathering in your area . 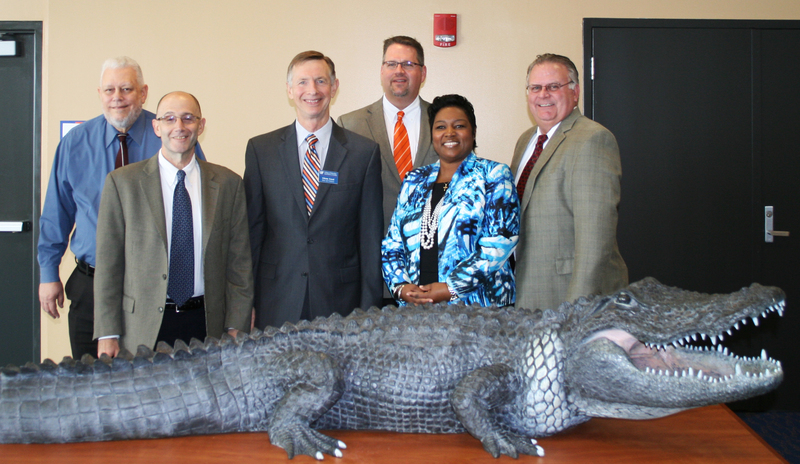 . .
Dean Glenn Good and the UF College of Education invite you to join us at the Tampa EduGator Reception to be held in the Culinary Theatre of the Epicurean Hotel. Valet parking will be validated. Please join fellow COE alumni and friends for food, conversation, and to hear the latest updates on the College’s initiatives. There will be a food demonstration by one of the Epicurean’s chefs! For more details and to RSVP, email rsvp@coe.ufl.edu. These annual events offer a great opportunity to listen to and network with education professionals from across the state. 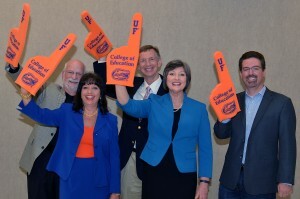 All UF alumni and students are invited to attend one or both events. 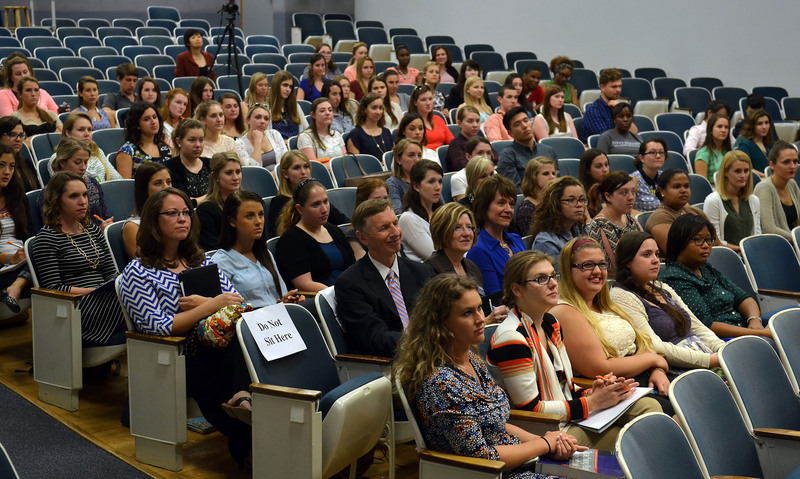 – The Alumni Panel will be held from 4 to 5 p.m. in the Reitz Union Auditorium. The first 25 attendees will receive a UF Education tote bag or t-shirt. 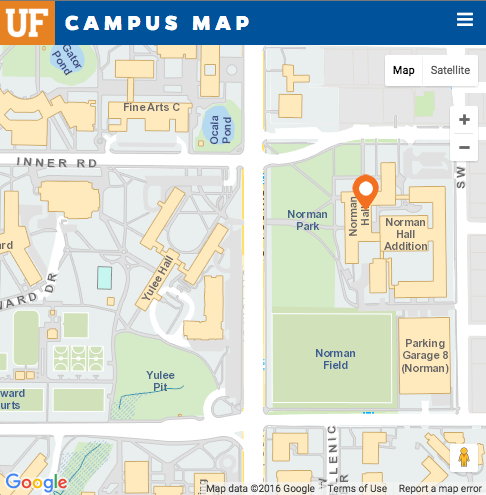 A panel of four dynamic College of Education alumni will offer career advice and talk about the distinctly different career paths they each have followed—quite successfully—after earning their education degrees from UF. Panel members include: Tina Calderone, school board member at Seminole County Public Schools; Jayne Ellspermann, 2015 National Principal of the Year and principal of Ocala’s West Port High School; Steve Freedman, executive director of the Institute for Child Health Policy of the State University System of Florida; and Skip Marshall, vice president and CTO of Tribridge, a technology services firm. You and a guest are invited to join UF Education Dean Glenn Good and Associate Dean Tom Dana, along with other alumni and education faculty, for a Chicago EduGator Reception in The Foundation Room of The House of Blues, 329 N. Dearborn Street. 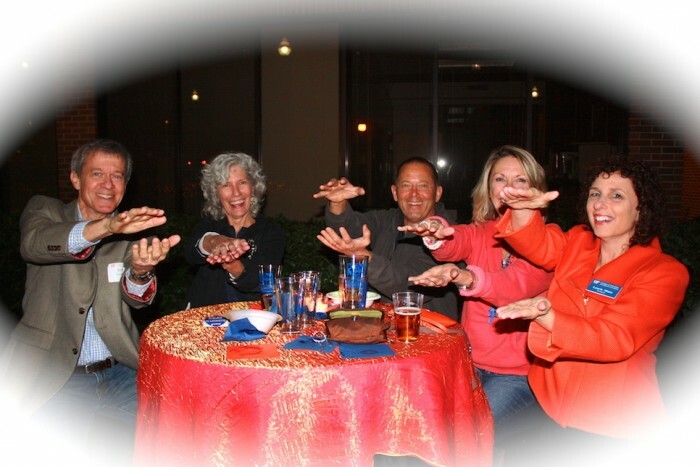 Join your fellow Florida alumni and faculty for great food and conversation. The Gator Nation is Everywhere! For questions and to RSVP, email rsvp@coe.ufl.edu. Sharyn Genschmer (BAE ’93 & MED ’94, Elementary Ed) was awarded Teacher of the Year at Valley Intermediate School in Pelham, AL. 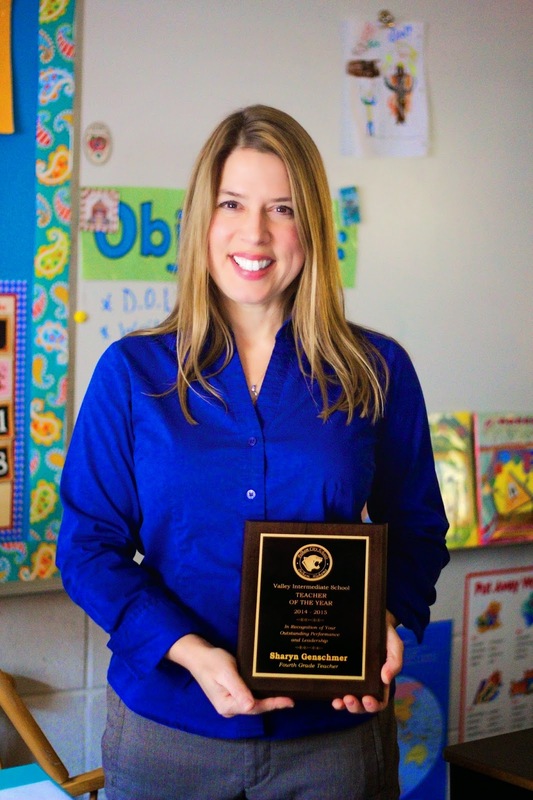 She has been teaching 4th grade for ten years at VIS and received the award for the year 2014. Sharyn is originally from Florida and received her Bachelor and Master’s degrees in Elementary Education from UF. She has taught 3rd grade, 4th grade, and 5th grade in Florida, Georgia, and Alabama. She moved to Birmingham ten years ago, so her husband could attend graduate school at UAB. Four College of Education alumni will offer career advice that extends well beyond teaching during the college’s annual Education Career Night set for April 8 at the Reitz Union Auditorium. The event is scheduled for 4 p.m. to 5 p.m. and is open to all. 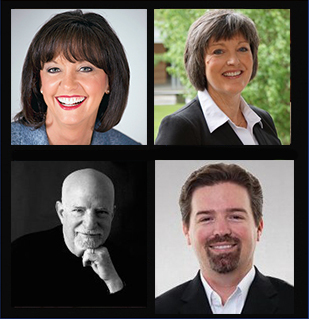 Panel CollageThis year’s four-member panel will share wisdom they each have gathered along four distinctly different career paths. Panel members include Tina Calderone, school board member at Seminole County Public Schools, Jayne Ellspermann, principal of Ocala’s West Port High School, Steve Freedman, executive director of the Institute for Child Health Policy of the State University System of Florida, and Skip Marshall, vice president and CTO of Tribridge, a technology services firm. Calderone, who received her Ed.D in educational leadership in 1999, was elected to the Seminole County School Board in 2010 and served as board chairman in 2011-2012. She has established a diverse and successful career that includes education, marketing, sales, public relations, fundraising and training. 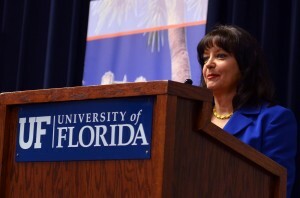 Previously, she worked as a college administrator at Stetson University and the University of Florida, and an adjunct instructor at both Seminole State College and the University of Central Florida. 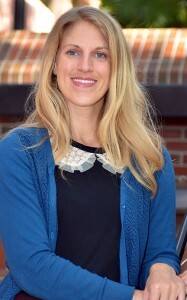 Ellspermann received her M.Ed. in educational administration and supervision in 1983. Recently, the National Association of Secondary School Principals recognized her as Principal of the Year. During her 11 years as principal of West Port High, she changed the school’s entire philosophy by spearheading a college-going culture personalized for students. 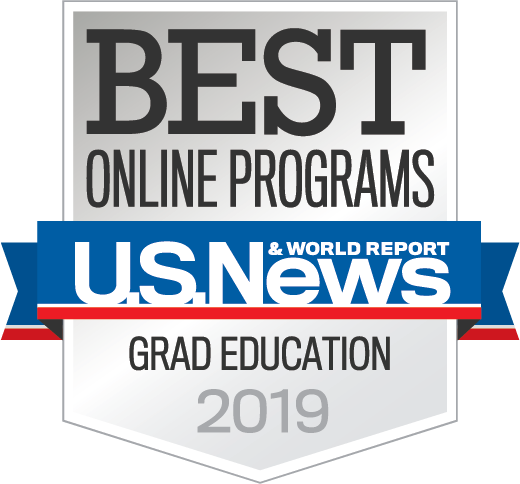 Under her leadership, course failure has nearly disappeared, the graduation rate has jumped 15 points and participation in activities has increased seven-fold to nearly 70 percent. Freedman earned his BAE‘ 95 and MAE‘97 in education, and went on to receive his Ph.D. in philosophy in 1983. When he’s not working as an executive director, he doubles as a USF professor of pediatrics, political science and public health. Previously, he was a professor of child health policy at the University of Florida for over 20 years. His lifetime achievements warrant his distinction as one of a handful of non-physicians elected to fellowship in the American Academy of Pediatrics. 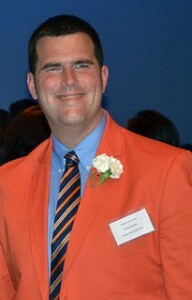 Marshall earned everything at UF from his BAE’ 95 in education to his MBA ’09 in business management at UF. He can be considered as the brains behind many online learning operations. He specializes in instructional design theory, integrative content design, learning program solutions and learning systems integration. He is a former faculty member at the University of South Florida and a teaching and technology fellow at the University of Florida. Following the panel discussion, UF’s award-winning Career Resource Center is hosting “Careers in Education” Career Fair in the Reitz Union Ballroom from 5 to 7 p.m.
For more information, visit: https://education.ufl.edu/alumni/career-night/. David Fields, a 2008 M.Ed. graduate in social studies education, has been named the Clay County (Fla.) School District’s Teacher of the Year. Fields has been teaching advanced placement U.S. history and American government at Orange Park High School for the past seven years, and also designed a sports history course that requires students to research the history of a pro franchise or college team. “I learned that being passionate about my profession helps to get students to buy into the subjects I teach,” Fields said. “Sometimes I think it’s crazy that I get paid to work every day and talk about subjects that I’m so interested in – whether it’s Teddy Roosevelt and the Progressive Movement or how instrumental he was in saving football from extinction in the early 1900s. “The Secondary ProTeach program at UF gave me the tools to enter my classroom on Day 1 as a consummate professional,” he added. “I need to adapt to new technology and content so I can meet the needs of students in the 21st century.” Students from Clay County (Fla.) Teacher of the year David Fields’ advanced placement U.S. History class show their support during a recent ceremony held at Orange Park High School. Fields’ former social studies education professor, Elizabeth Washington, said she wasn’t surprised to learn of Fields’ selection as Teacher of the Year. “Dave was very committed to making his lessons culturally relevant and engaging,” Washington said. “He was always very passionate during classroom discussions — always willing to think through challenging issues and make thoughtful contributions.” Fields, who also earned bachelor’s degrees in history and political science with a minor in secondary education at UF, will go on to compete to become Florida’s Teacher of the Year. Clay Today, a weekly newspaper in Clay County, ran a recent article on his latest honor. UF higher education administration alumna Zaria Malcolm (PhD ’11) was recently appointed vice principal of academic affairs and institutional advancement at Excelsior Community College in Kingston, Jamaica. 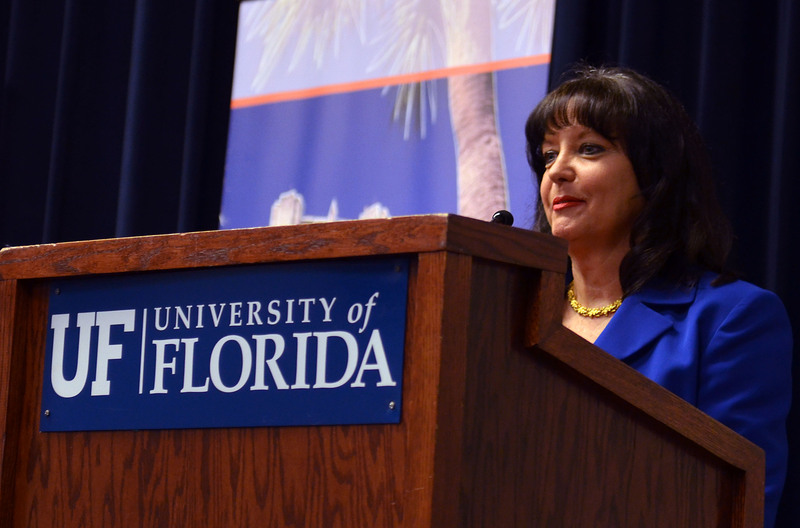 Malcolm, a native of Jamaica, earned her doctorate at UF with a concentration in qualitative research methodology. Zaria Malcolm, “The program and degree from UF was the best possible preparation for the work I’m doing now,” she said. 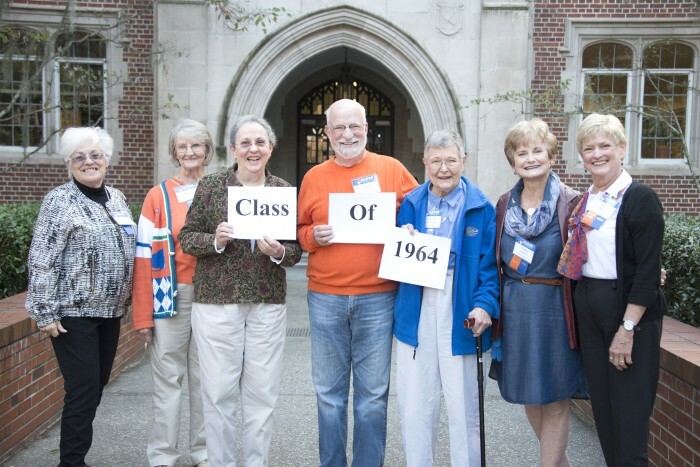 What advice would UF College of Education alumni who graduated exactly a half-century ago–from the class of 1964–give to today’s education students? Seven members of the COE class of 1964 pose at a luncheon honoring their induction into the UF Alumni Association’s Grand Guard for 50-year alumni. Pictured from left are Anna Karayiannakis, Joyce Neilson, Diane Haines, Steve Freedman, Carol Hayes-Christiansen, Virginia “Pep” Culpepper and Diane Brown.